The new Compass Rose 2 pendant necklace features a more rounded body shape than the original Compass Rose pendant necklace. 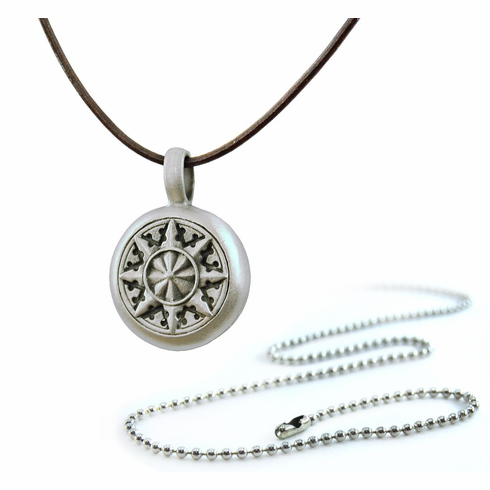 Designed and manufactured in the USA by Journeyworks, this compass pendant features a recessed and color-filled compass rose on the front side of the pendant, and a working compass capsule on the back side of the pendant. Each pendant is cast in solid pewter, and features both an adjustable leather cord (30” max) necklace and a traditional stainless steel ball chain (30” max) necklace. Use with either of the two necklaces provided, or use this great compass pendant on any necklace of your choice. The natural silver color of the solid pewter jewelry goes with almost anything, and won’t tarnish over time.